Dystlegh Grange receives “Outstanding” rating from C.Q.C. A Greater Manchester care home has been judged one of the very best in the country after receiving an “Outstanding” rating from the Care Quality Commission. This status – the highest achievable – puts Dystlegh Grange in the top 0.5% of all residential care homes in England. 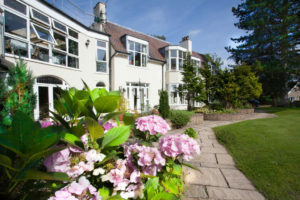 Situated in Disley, near Stockport, the CQC lists Dystlegh Grange as being in the ‘Greater Manchester’ area – where only one other residential home out of 962 has the same accolade. The CQC awarded the “outstanding” rating after carrying out an unannounced inspection when they looked at several important factors including how safe, caring and effective the service provided is. In addition to speaking to residents and staff, they spoke to families of residents, local GPs, and other professional and social contacts. Dystlegh Grange was once the 19th hole for Disley Golf Club, before being purchased by Brian in 1980. It was subsequently brought to life and transformed through a programme of imaginative re-design and development into the attractive blend of accommodation seen today. Over the years, it has been shaped into Brian’s vision of how retirement living and care should be provided. This vision is shared by the residents and Managers, Joanne Bainbridge and Nicola Christie. The enthusiastic team they lead have similar values and beliefs, which has resulted in a unique, safe and caring community where a person can live independently with support. Thoughtfully designed, the 37-individual apartment or open plan studio suites are surrounded by an informal neighbourhood of beautiful spaces for socialising with family and friends. Most suites enjoy either a private outdoor space or balcony, in addition to the lovely communal gardens.